Conference feedback for Beyond the Grave 25-27 April 2014 organised by Sharon Slater for Limerick Archives and Mary Immaculate College. I have known Sharon for a long time and am very familiar with her work. She is an avid researcher and is passionate about the local history of Limerick. She has willingly passed on information about my own family when I have been engaged in genealogical and local history research. She is thorough, genuine and a great worker. I would classify her as being a creative and talented thinker as she constantly strives to improve her excellent website: http://www.limerickslife.com On a few occasions, I asked Sharon to obtain information about various items pertaining to local history and she got this quite promptly for me. 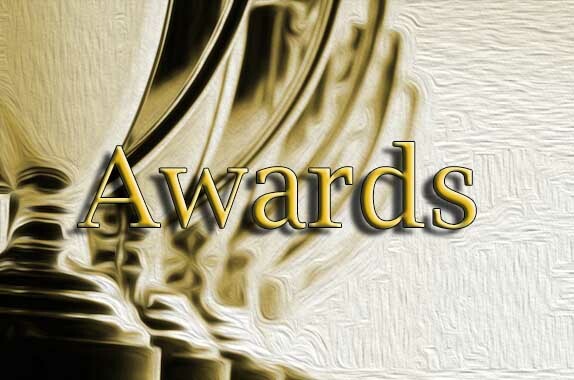 She will be of high calibre to any organisation, association or company who avails of her services and deserves the highest promotion offered. In conclusion, I would like to say, any body wishing the highest class of computer and website work would be well pleased to have Ms. Slater as a resource. With her good work ethics, I’m sure Ms. Slater would be an asset to any organization. If there are any questions, please feel free to contact me any time. It’s been a joy to find Sharon, a lady who’s historical/genealogical knowledge of Limerick has amazed me. Sharon has been extremely helpful in supplying leads and discovering documents which were unavailable on other family tree websites, containing details of relatives who would otherwise be lost and forgotton. Her help has enabled me to expand my family tree. She has an excellent understanding of the numerous historical documents that are available and marrying them in together. I would recommend Sharon, wholeheartedly, for anyone wanting to further their family history. To Whom it May Concern,I am pleased to recommend Sharon as a researcher, writer and presenter of local history. Gabriela Avram and I run a volunteer conservation group, Limerick Riverpath Volunteers from the Interaction Design Centre in U.L. and Sharon gave an excellent account of the history of the Park Canal at a Guided Walk we organised last September. We find her generous online sharing of information most helpful in our ongoing promotion of this amenity. Sharon also researched a forgotten famine graveyard for a project we organised with a craft teacher and the Limerick Learning Hub – she pitched the talk perfectly and engaged the children and their teachers in learning and discussion of the history of their area. If you have any enquiries about this reference, please do not hesitate to contact me at this email address. As Assistant Project Coordinator for Open House Limerick 2012 I was lucky enough to work with Sharon who organised and led one of the most popular tours of the festival. She is exceedingly generous with her own research, rare photographs of Limerick, advice and her time. 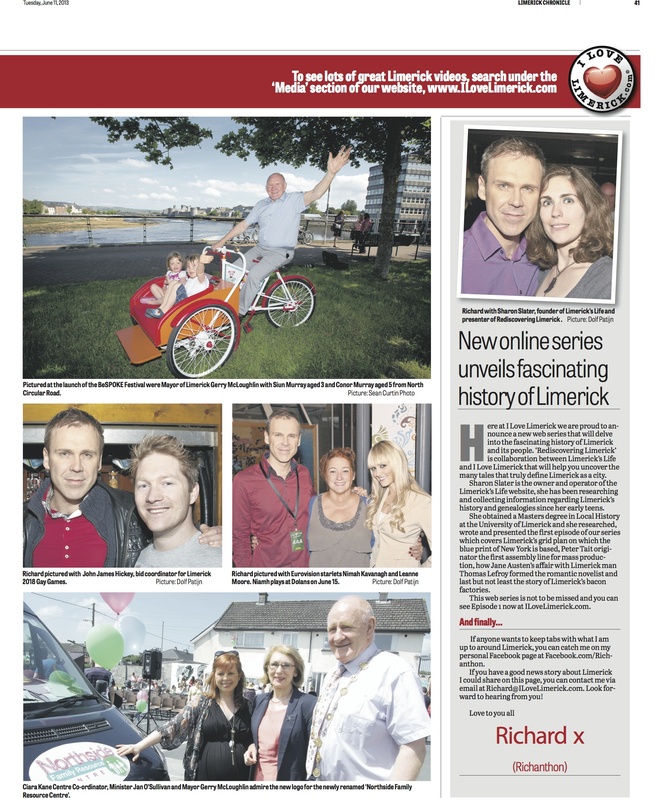 Limerick’s Life is doing an invaluable service for local history in Limerick. I approached Sharon to assist with putting together an Architectural Cycle along Limerick City canal bank, as part of Limericks inaugural Open House event. Sharon was very approachable and listened open mindedly to the activity we were planning. and at no point hesitated to get involved. Sharon help in setting up historical images in our office for all of the general public to view, which caused a great buzz in out pop-up office in the middle of O’Connell Street. Sharon was also extraordinarily helpful with other ideas to help make our event special. On the day of our even Sharon voluntary offered her services to guide 26 people along the Canal Bank, informing and educating the general public of the historical architecture of this area. Not only was it the highlight of the event, it was my own personal highlight of organising such a successful event. I highly recommend Sharon for employment. She is a team player and would make a great asset to any organization. Sharon knows more about the history of Limerick than anyone I know. Her website is incredible. She is intelligent, witty, creative and someone I greatly admire. I love working with her and always look forward to it. Sharon has displayed a timeless commitment to her field. A multi-faceted talent, Sharon adroitly navigates between digital and print mediums to deliver a finished product or resource to satisfy the most discriminating standards. She is an effective communicator, both orally and in the written word, whose talents and capacity for detailed research have yielded top shelf publications with broad appeal. Sharon is a team player and would be a welcomed addition to any employer seeking an articulate, intelligent and driven candidate who numbers professionalism and quality amongst her highest priorities. To Whom It May Concern, Sharon Slater would make a great addition to any organisation. She is an intelligent, hard working and dedicated individual who knows how to execute the job she has been tasked to complete. I have used her abilities on two separate occasions, firstly, she designed the St. Munchins Community Centre logo for our website which is a beautiful, clean, modern design. Additionally, Sharon did some genealogy research on my own family which was done incredibly. The information was presented promptly in a well laid out and organised fashion. I would highly recommend Sharon Slater for a job in graphic design or research. We met with Sharon, the owner of this wonderful site on each of our visits where she guided us through the genealogy haze of Limerick enabling us to narrow our search to Prior’s Land. Should it have not been for the knowledge Sharon possesses, obtained over years of research and personal interest, then there was no way we would have advanced to the stage we are. 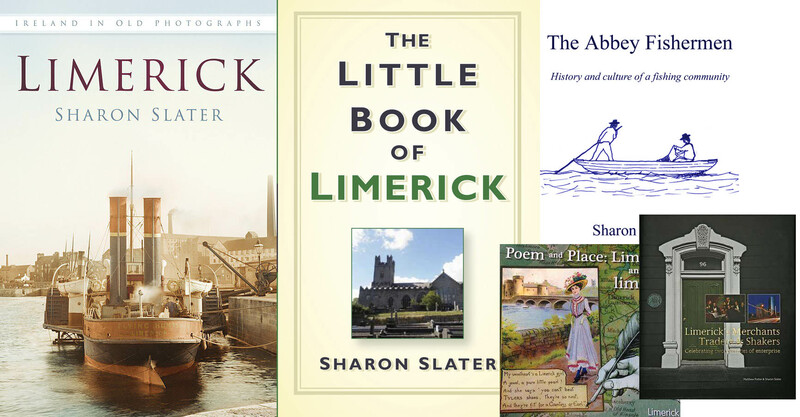 Sharon has a passion for the gathering of the history of Limerick, in particular the City, and had it not been for her dedication to her project then so much history of this great city would be lost to us all. Thank you Sharon. Sharon Slater at www.limerickslife.com is doing digital local history and genealogy better than most anybody else today.